Interfaith Community Services » Footwear etc. and Naot Donate over 400 Pairs of Women’s Shoes to Interfaith! Footwear etc. and Naot Donate over 400 Pairs of Women’s Shoes to Interfaith! Footwear etc. Director of Marketing, Rebecca Monarch with the over 400 shoes donated to Interfaith! 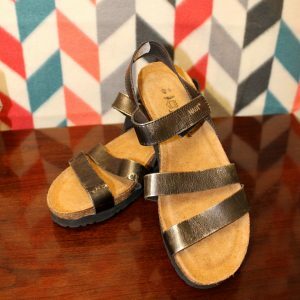 Over Veteran’s Day Weekend, Footwear etc., a local, family-owned shoe retailer, collaborated with Naot Footwear, an Israeli shoe and sandal manufacturer, to organize a shoe drive benefiting Interfaith Community Services. Footwear etc. offered to donate a pair of shoes to Interfaith for every shoes that was tried on. Throughout the weekend, many customers tried on Naot’s shoes at Footwear etc., which resulted in over 400 pairs of women’s sandals being donated to Interfaith! These shoes are typically priced between $100-$150.00, making this a very large and generous donation! Thank you to both Footwear etc. and Naot for this wonderful donation! Our neighbors in need will appreciate these very comfortable and stylish shoes!